As a steel estimator my concrete knowledge is little or none, but I have a contractor that has asked for a number on providing beam and pour deck support on a project he is working on, I think it is more of an exercise to talk the home owner out of placing this sun terrace in this location citing the steel and decking costs. 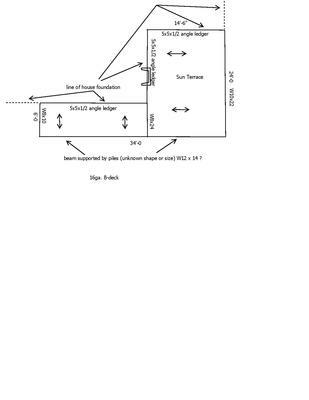 Nevertheless I need to be somewhat close in my takeoff to provide this cost and as stated earlier I really have no idea what is needed as far as steel, can you look at the attached drawing and tell me how completely off base I am with my ideas. The contractor is not sure what he wants to do, has only thrown out tidbits of information and leaves me little to go on, I have drawn the attached drawing based on architectural drawings I have but they are not available electronically or I would send them, I don't have a set of structurals so I am purely speculating everything at this point, given this lack of information am I even close at this point with my take off? The quality of the sketch provided is very poor that I have a hard time figuring out what is shown. It appears at the perimeter there is foundation wall and it looks there are L5x5x1/2 angles ledgers which is an over kill. A L4x3x1/4 angle ledger should be sufficient, the 4 inch leg match the slab thickness which will become the pour stop for the concrete. If the concrete is exposed to weather, it is better to form it so that the steel don’t get rusted or you can use galvanized steel angles. It look that there is 14’-6” deck span which will not work unless you use heavy deck 18 to 16 ga deck. You should look into spanning the wide flange beams in the 14’-6” direction and use 3 or 4 wide flange beams such that the deck span no more than 10ft. I think your estimate is on the light or not enough steel. The angle ledgers may be over kill but the sketch is not clear enough for me to determine if you have enough steel and labor there to account for the additional wide flange beams needed.